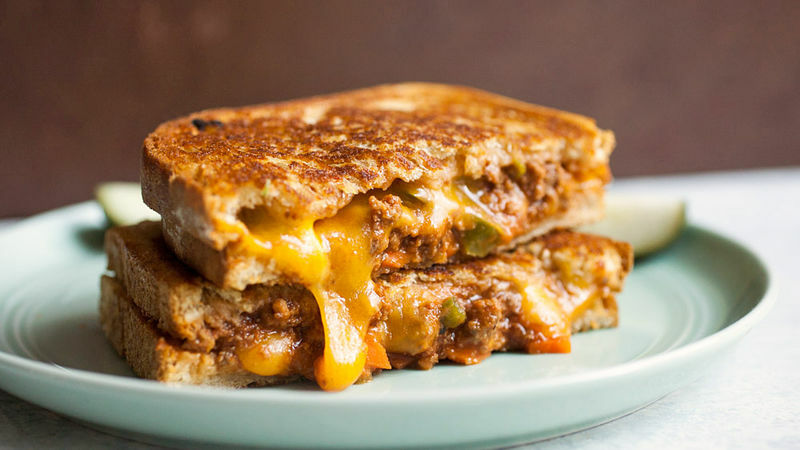 To make the sloppy Joe mixture, start by heating olive oil in a skillet over medium heat. Add ground beef and cook, breaking up beef as it browns, until cooked through, about 5-6 minutes. Add green peppers and carrots to the beef mixture and cook for another few minutes until veggies start to soften. Then add garlic powder, tomato sauce, Worcestershire sauce, brown sugar, and a pinch of salt and pepper. Stir together and simmer for about 5 minutes so mixture can thicken. If the sloppy Joe mixture seems dry, add 1/4 cup water. Heat a non-stick skillet over low heat. Lightly butter two slices of sandwich bread. Cut cheddar cheese into 1/4-inch cubes. Take about 1/2 cup of the sloppy Joe mixture and stir in 1-2 oz cheddar cheese cubes, depending on how cheesy you’d like your sandwich to be. Add one slice of bread, buttered side down, to the hot skillet. Top with the cheese and sloppy Joe mixture. Add the second piece of bread, buttered side up. Cook over low heat for 3-4 minutes per side until bread is nicely browned and cheese is melted. Repeat with remaining ingredients and serve immediately. Yields 6 sandwiches.